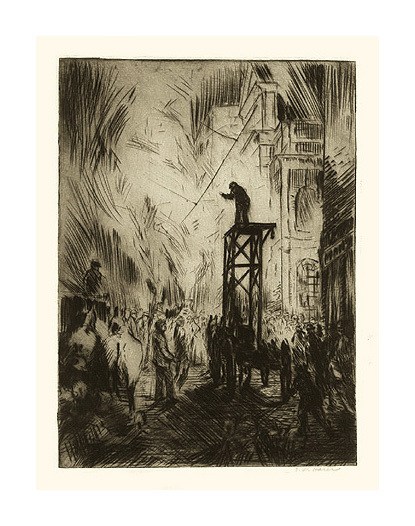 Untitled (Union Meeting) - - c.1920, Etching. Image size 11 5/8 x 8 1/2 inches (295 x 216 mm); sheet size 14 7/8 x 10 1/2 inches (378 x 267 mm). A superb impression, in dark brown ink, on cream wove paper, with full margins (7/8 to 1 3/4 inches). Pale glue stains in the top margin, well away from the image; pale tape tab stains on the four sheet edges, verso; otherwise in excellent condition.